Party Barges (2 Logs and 3 Logs) Pontoon Boats up to 26` 2"
Fishing Barges (2 Logs and 3 Logs) Pontoon Boats up to 26` 2"
Your Boating Headquarters For A Lifetime! Once you've decided that a pontoon boat is the perfect platform for new family adventures, you've come to the right place. 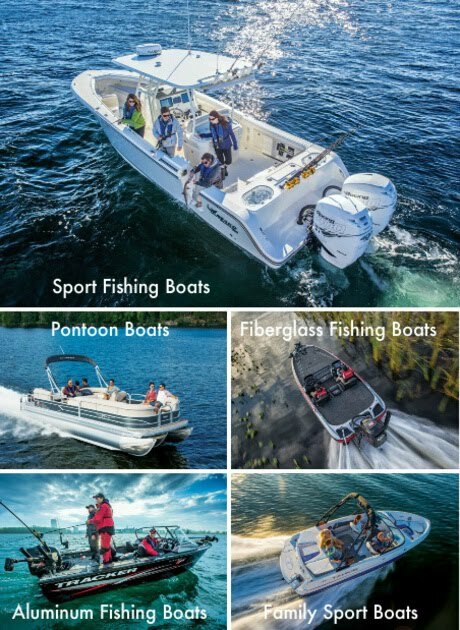 As part of the Bass Pro Group, SUN TRACKER® Boats has been helping families all over the world build lifelong memories with their pontoon boats since 1983. Our roots at Bass Pro Shops® go back even further, to 1972. It's a three-decade heritage of family-friendly innovation, comfort and quality that has been integrated into every single model. From the moment you select your favorite SUN TRACKER pontoon boat model, through year after year of unforgettable family memories, you'll enjoy peace of mind knowing you have the backing of a proven industry leader that's dedicated to your long-term ownership satisfaction. SUN TRACKER pontoon boats are available at every Bass Pro Shops and Tracker Boat Center® location, as well as at a nationwide network of quality independent dealers. As a SUN TRACKER boat owner, you'll have access to one of the largest and best service organizations around. We want to be your boating headquarters for a lifetime! This year—or any year—your family is the best investment you can make for the future. And a SUN TRACKER pontoon boat is the perfect long-term asset. Payback comes fast—with the fun and forever memories of family time spent together. It's where generation gaps disappear. And your time on the water is a world away from the outside world. Meet the new SUN TRACKER pontoon boat lineup! Eye-catching styling and graphics. Sleek consoles, gauges and controls. Fishing seats and at least one livewell on every fishing model. Plush carpet and luxurious upholstery. And many, many more amazing features! SUN TRACKER is the pontoon boat of choice of Walt Disney World® Resort and Big Cedar® Lodge. As two of the leading family vacation destinations, these resorts cater to a demanding clientele that expect only the best. It's just another affirmation of the quality, elegance, features and fun-loving abilities that come standard on every model. For a high-value investment in a lifetime of memories, you just can't do any better than a SUN TRACKER pontoon boat. 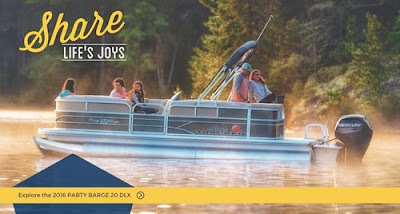 Visit the Sun Tracker Pontoon Boats website for Features and Specifications of the full line of Sun Tracker "Family Entertainment" Pontoon Boats. Luxurious 3 Log Pontoon Boats up tp 27'5"
Every moment onboard your REGENCY Pontoon Boat will be one to remember. Whether you’re relaxing in any of the plush lounges throughout and watching your cares and concerns float away with the waves. Maybe you’re grabbing a drink and hors d’oeurves from the refreshment center and entertaining family or friends. Or, you’re just taking a spirited cruise to your favorite restaurant. Whatever you’re doing, wherever you’re going and whomever you’re with, every inch of the REGENCY invites you to sit back, relax and enjoy the moment to the max. Visit the Regency Pontoon Boats website for Features and Specifications of the full line of Regency "Luxury" Pontoon Boats.